Special Containment Procedures: SCP-1729 is to be kept in a standard steel containment chamber, with a double door. It is strictly prohibited to keep both doors open at the same time. Update ██/██/████: SCP-1729 is currently kept in a standard, 15x15x15 meters steel containment chamber. To its roof is hung a reversed, semi-spherical, 6-meter radius hollow steel container, resembling a diving bell. The bell is suspended 4 meters above the floor by a steel anchor chain. Unless equipped with steel gloves, every non-D-class personnel desiring to enter SCP-1729's room has to be extremely careful not to come in contact with the bell or SCP-1729 in any way. In the event that, upon entering the room, SCP-1729 is found moving on its surface instead of the bell, the door is to be closed immediately, no matter the circumstances or whoever is inside. Should SCP-1729 flee its room nonetheless, it is strongly advised for every personnel nearby to run as fast as possible in the direction opposite of that which leads to SCP-1729. 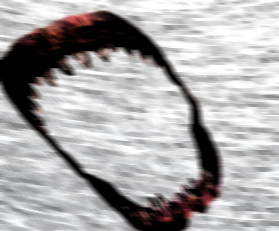 Description: SCP-1729 appears to be a two-dimensional white shark jaw. Besides its teeth and gingiva, no other body parts of SCP-1729 seem to be existing. SCP-1729 can be seen crawling against any solid surfaces [OUTDATED: cf. Addendum 1729-A], but cannot come off them to move through air or other gasses. It completely ignores liquids and stays attached to solid materials at all times. However, SCP-1729 can move through supposedly all non-steel solids, including organic substances such as bodies. While doing so, every molecule of said solid passing through SCP-1729 is immediately digested and regurgitated. The means used for the digestion are currently unknown, SCP-1729 showing no existence of a digestive tract. As of ██/██/████, it has been stated that SCP-1729 is, in fact, incapable of moving on non-flat, too complex steel surfaces, such as chains or armors. This discovery has permitted a much safer containment protocol, and thus allowed O5-██ to reclassify SCP-1729 as an Euclid.